What Is SME Exchange Full Form? India has a steady float of ideas. Every day we see newer and new businesses are floating and a new set of entrepreneurs are emerging. But many of them face some initial problems or hurdles. The problems can be from raising money, people skill, technology or marketing. Clearly, there is no ready-made guide available for these class of people. The Indian exchanges like BSE and NSE has come up with a solution for these new entrepreneurs so that they also can raise money from the markets. Let’s understand what is SME or SME Exchange full form. SME stands for “SMALL AND MEDIUM ENTERPRISE”. MSME stands for “MICRO SMALL AND MEDIUM ENTERPRISE”. Micro, small OR medium companies are broadly classified in 2 sectors – Manufacturing Sector and Service Sector. SME companies are also classified by their respsctive investments (see the image below). As discussed earlier both BSE and NSE exchange has setup a platform by which the small and medium enterprises can get their shares listed. That is called SME exchange. So on other hand we can say that SME Exchange full form is “small and medium exchange”. The name of the SME exchange for Bombay Stock Exchange is BSE SME Exchange and the name of the SME Exchange for National Stock Exchange is Emerge. On the year 2011 SEBI has launched the SME platform to allow small and medium enterprises to raise capital. On February 2012 the first ever SME IPO on BSE SME exchange was floated. 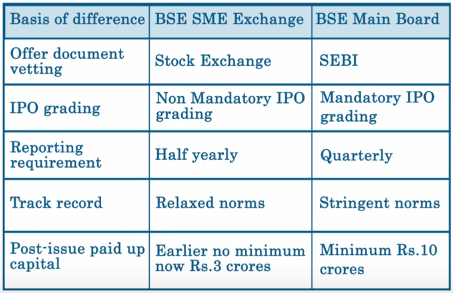 The image below will describe the differences between an IPO floated on the BSE SME Exchange versus in the regular BSE Exchange. 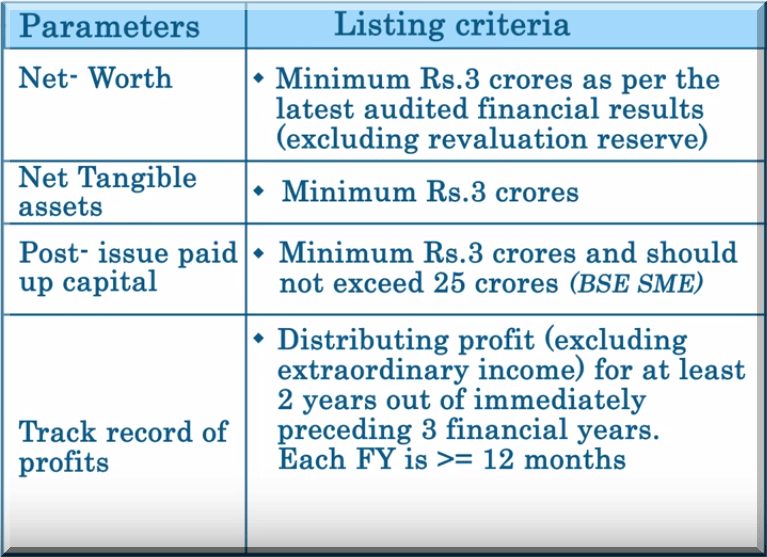 Now, the following image will describe the listing criteria in the SME exchanges. How Stock Market Listing Helps SME Companies? Leveraging ratio gets more attractive and capacity to raise debt increases. Widens capital base and increases working capital. Can raise funds at low cost and comparatively relaxed norms and compliance. In this post I have discussed what is SME Exchange and SME Exchange full form. I have also discussed the basic criteria of listing in SME exchanges and the benefits of listing. For any questions I will like to answer your comments below.